Scrangie: Ooh.... new stuff at Claire's! Man, I can't get over how much I love the polish they have at Claire's! It is worth braving the horrible music that sounds like a parody of itself and the feeling like you're a few decades too old to shop there to get these. Claire's isn't so bad though. I like a lot of their jewelry- they have slap bracelets! Anyway, I went into Claire's the other day to see what kind of new polish they had and wow! I saw these. Love at first sight. Had to have them. Go Claire's. Woo! Chunky Green. Oh man. Just look at it! Look! Grassy green glitter!!! With a hand full of silver hexagons thrown in! Exclamation points!!!! This was three coats. Here's Chunky Green over black. It doesn't need it. I thought it was going to be more sheer than it actually was so I preemptively did a base of black... bleh. I don't care for it over black. Chunky Purple. I dunno if this really looks purple to me. Looks like a really dark pink. Maybe a drop of purple. Oh well, it's still pretty. It reminds me a lot of Claire's Rock, except I don't remember that one having any silver hex glitter. This was two coats. Glitz And Glam. Holy waffles. I love this so much. I can't even tell you how giddy this polish makes me when I look at it. It is NEON PINK with HOLO GLITTER!!! It kinda looks like there's a little bit of a blue flash to it too, but it's very subtle. There's also a sprinkle of very big hexagon glitter in there too and they come out very randomly, I actually had to intentionally fish a few out so that each nail would have one. The base color of this is similar to China Glaze Shocking Pink, it's a little lighter and waaaaaaaay brighter in real life. Dream Catcher. I'm not really into the whole jade/mint green trend. I don't like the way it looks on me, it gives me big red lobster claw hands. Anyway... Dream Catcher is actually surprisingly nice. It has a little shimmer to it. It has a more yellowy-toned green look than most of the pale greens I own, which I think helps a bit when it comes to making my hands look red. This is a very pale shade and I find it very calming and dreamy looking. I have heard that it's similar to Chanel Jade, but I don't own it so I can't really say. Some people have also told me that they thought the formula was horrible... however... I found it to be quite lovely. This picture is two coats, no topcoat, no basecoat. I did not have any streaking or anything, it went on perfectly for me. If you are having a lot of trouble with polish streaking, you should try using more polish on the brush and using a lighter touch on the brush. So... yeah. I love Claire's. The polish seems to be permanently on sale for buy one, get one 50% off, cause every time I go there that's how it is. Which is kinda dangerous cause it forces me to buy polish in pairs. I can't just get three, I have to get four. But if I see a fifth one I like I have to get six! They're tricky, man. They know how to get me. I love Chunky purple- i'll have to go in claire's when I go to the mall later today. What's the wear like on these? oh the pink is lovely, want that one!! I hope they sell these in the UK! I had better go and have a look. Trouble is that you make EVERYTHING look yummy with your photo-wizardry and magical arts! Aw, man. I passed up the chunky glitters because I thought they'd be sheer. I did get Dream Catcher since it's pretty close to Chanel Jade (I'm a mint freak). I might have to go back and get some of the chunky glitters now. 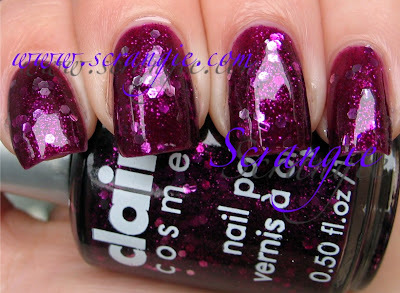 omg glitz and glam is like my DREAM color its so amazing I HAVE to go buy it!!! Glitz and Glam is calling my name! But like you said I have to get them in pairs...maybe Magic will be its sibling. Last time I bought claire's polish, the stench was so bad I had a headache by the time I finished my first finger. Is it still bad? If not, I think I might go grab a couple. I actually really like that Dream Catcher. I am not sure I would wear that green, but it looks nice. I am definitely going to have to get everything there except that bright pink...I've been lemming the Dream Catcher for a while. I hope my little backwoods Claire's has it or I will has a sad. haha- I know what you mean by all those buy one get one free or 50%off. The Us Claire's seems to be different than the european one because the european aren't named and we don't have those colour range( damn- I really wanted Magic). Wow, I see where I'm going this weekend!!! Definitely going to Claire's and I think I'm going to drop by Target or Walmart to look for some of the Nicole polishes you showed us in the last post! Great, now I have to go into Claires. Ugh, thanks! Haha, thanks for these swatches, I need to give these a try! WOW I really want Glitz And Glam, chunky blue, Chunky Green and chunky purple! How pretty! Especially Glitz And Glam, and I do not own many pinks you know. But this pink look amazing! Oh my they are all so pretty! Chunky Green and Chunky Purple are stunning.. wow. Want! These are pretty but I'd worry about chipping... How was that? love the new colors.. i lopve your nails how do you keep them so nice? I agree with you on the lobster claws! We have similar skin tones so I usually get the colors that look good on you. I love Chunky Blue. Oh thank you for posting your comments on mint green! I thought I was the only one who just couldn't get on board with this trend - I even passed up the often raved about Essie Mint Candy Apple on clearance at Ulta yesterday because I Just. Didn't. Like. It. 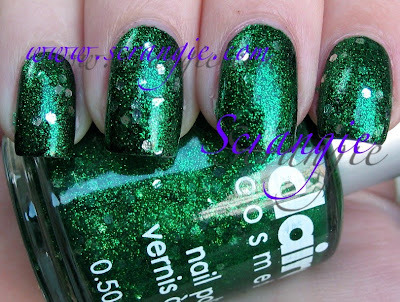 I love the way the chunky polishes look, but there's something about hexagonal glitter that just rubs me the wrong way. It's a personal bugaboo. I agree completely though about Claire's and their polishes - I have some that are really wonderful. SWEET!!! I just got my ears pierced again about a week and a half ago, so I have the 20% off coupon that comes with the piercing... OMG I'M SO EXCITED!!!!!!!!!! "Dad, when are we going to the mall?" Haha, Scrangie, you are TOTALLY my enabler!! My mom is starting to hate you, because you make me buy so much polish!! Chunky purple reminds me of Zoya Roxy in color - at least based on what i see on my monitor, are they similar ? WOW. Chunky Blue looks AMAZING! I may have to find myself a Claire's around here! Slap bracelets!? That takes me back. I couldn't tell you how many years have passed since I've been inside a Claire's--somewhere between 10 and 15?--but I may have to brave it for Dream Catcher and one or perhaps three other colors that catch my eye. Oh wow, I really like them!! I love Claires nail polish too! Meg Peg is one of my favorites! UAU! Chunky ones are really great and different! Wow, will have to have a look for these - its so rare that I see reviews for polish that I can actually get hold of here in the UK! Right with you on the pale minty green, makes my hands look like boiled beef so I tend to stick to dark and vampy to make them look nice and deathly pale instead! You're nails look fab in all the pictures, and I really like that green!! btw; I gave you a blog award. 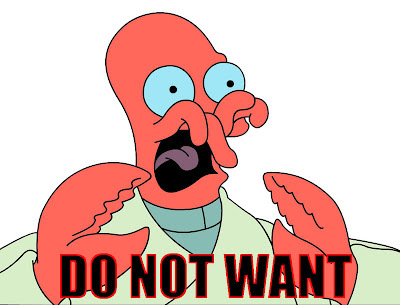 I laughed so hard at the dr. Zoidberg photo it was rediculous. The mint green intrigues me. I think I must have it!! 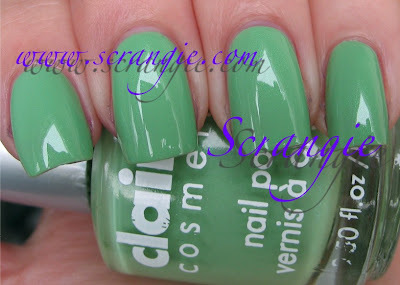 honestly, the last light green is very close to chanel LE jade! if anyone's looking for that shade, try this light green. 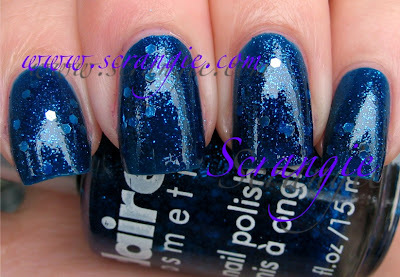 I am a fan of the Claire's Glitters, I have to go for the blue one, it does look lovely! I didn't know claire's had a nail polish line! Do you know if I can buy them online? I don't think they have a retailer here in Italy..
Chunky Green and Purple look fab!